The Muskegon ChannelCats will celebrate our 20th Anniversary in 2017. Learn more about what's in store for the upcoming season below. The Muskegon ChannelCats manage select travel baseball teams from Muskegon, Michigan and along the Lakeshore. The ChannelCats give youth baseball players the opportunity to build a solid foundation of fundamental skills, learn the value of teamwork, and, most importantly, have fun playing the game of baseball. 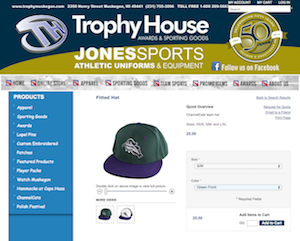 We're proud to announce a partnership with Trophy House that will allow fans to purchase Muskegon ChannelCats merchandise online. Support the team by sporting ChannelCats T-shirts, sweatshirts and hats. Team apparel is available in a wide variety of styles and colors. Items can be picked up at Trophy House, 2350 Henry St, Muskegon, MI 49441. Click here to get your ChannelCats gear. The Muskegon ChannelCats are proud to announce the rosters for our 2016 travel baseball teams.